If I had a penny for every time the Thunder let me down...I'd be very poor. OKC lost last night's game against Phoenix Suns with a result 113-110. The man of the hour was Suns' forward Grant Hill who scored a season-high 30 points. Those points were also his 30 point game since 2000. During the first half, the Thunder was showing a fragile offensive. The only one who was trying to keep up with the Suns was James Harden. Shots were definitely lacking except for Todd Lafferty who made the Midfirst Bank half court shot for $20,000. The Thunder turned things around during the third quarter. OKC's offensive started their engines and scored 40 points. In the fourth quarter they took the lead by three points. 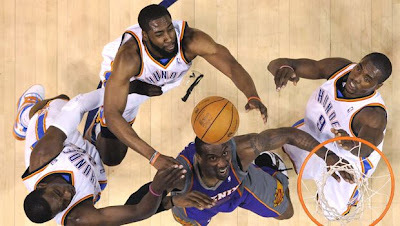 Although OKC was doing a good job, in the final minutes they were unable to close out the game. Westbrook was fouled with only 30 seconds left and scored two foul shots. This game's destiny was written when the Suns were fouled which "helped" them lead by three points. At the buzzer Jeff Green tried to score but the ball merely hit the front of the rim. Durant finished the game with 28 points, while Jeff Green, Russell Westbrook and Nick Collison all had 19 for OKC. This loss marked the end of the Thunder’s five game win streak. OKC's next game is against Charlotte Bobcats. Let's hope that our guys will start a new winning streak from this game and continue it until the season is over. After Durant, who's the next guy OKC needs to lock up long-term? Picture Window theme. Theme images by LUGO. Powered by Blogger.